So my question is: Is the Hogwarts Express available somewhere? I will state that this question has its roots back in elementary school, specifically 5th grade, August 2000-May 2001. I was walking down the hall heading back to the classroom after going somewhere (I can't remember where, but I know it wasn't the library as I wasn't coming from that way), and I passed a fellow student in the hallway and she said, "You look like Harry Potter." And I'm thinking, "Who? What? Who's Harry Potter?" Obviously I was the only person in the entire school who hadn't heard of Harry Potter. So when I got home from school, I asked my mom "Who's Harry Potter?" So she explained to me all about Harry Potter. So not long afterward, I got Harry Potter and the Sorcerer's Stone on VHS for Christmas. I watched it and I found it interesting, and I did notice that the girl had a point: At the time my hair and glasses looked like Daniel Radcliffe in the movie, though the hair was blonde and the glasses were more rectangular than rounded. I never was a big Harry Potter fan, but then came my Senior Year of High School, which was 2007-2008. I had just read Harry Potter and the Deathly Hallows and I decided to fill in the area between the next-to-last chapter and the final chapter, set 19 years later. I began a simple Microsoft Word document that I thought was going to be a few pages long. The result: a 200+ page document that took a lot of time to write, mostly on and off writing. Then came my Creative Writing class in College. I mentioned the document to my professor, and she said she would like to see it. Well, I ended up making a dent in the amount of printer paper the college library had printing it out. I then put in a simple hardcover notebook like those you get at an office supply store and showed it to her. She was, and I quote, "Impressed" by it. Since then it's been sitting in my bedroom (and as a file on my computer) untouched. I've since found out some more info about what happened in those 19 years so I need to go back sometime and redo it, remove some parts and add more parts to make it more in line with what's on pottermore.com. Okay, back to what this thread is about. I did some research into the Hogwarts Express and it was pulled Great Western Railway 4900 Class 4-6-0 5972 Olton Hall. The train seems to be made of MKI coaches and probably made of one BCK and several CK coaches, maybe an FK and/or SK or two mixed in. So the question is: Is the Hogwarts Express available somewhere for Trainz? A quick search of the DLS revealed that no GWR 4900 class loco is available. There are no GWR MKI coaches but there are GWR BCK and GWR CK coaches available. However, if you want these in the Hogwarts livery then there may be copyright issues. Look up under 'Hogwarts' on the DLS. There is a very basic GWR Hall loco available, but it works. 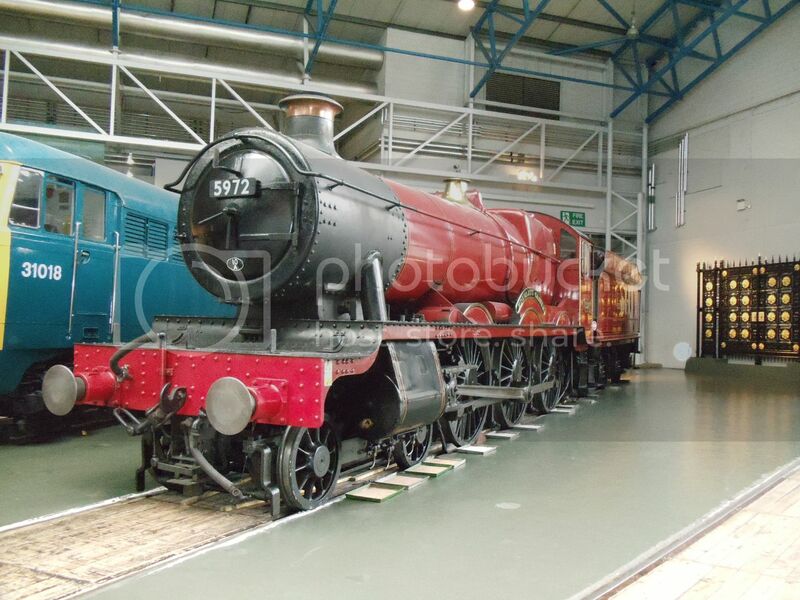 The original loco is in the National Railway Museum in York painted in the colours for the movies. And, yes it was originally Olton Hall. BR Mk1 carriages are available on the DLS. Also from the Railsim UK/Trainz Classics site. The "Hogwarts Express" is a mis-match of a repainted GWR Hall loco and maroon livery BR mark One coaches. As already noted, any attempt to reproduce and distribute something more specifically "Potter" likely to incur copyright wrath which would make that surrounding Thomas a walk in the park. I don't like Harry Potter nor do I like British trains (especially the steam... blegh), but something did come to mind. I thought of Paul, from Paulz Trainz, who made at least 25% of all notable locomotives in existence... so I checked out the page for the Great Western, and low and behold, there are a few 4-6-0s. Maybe you can skin one up to look like the Harry Potter engine?